Though not a fan of anything overly floral, got to admit Sridevi looks positively radiant in hers. The grey did nothing for her. Or us. She looks beautiful in green sari. I have always liked her. very preety lady. Radiant is right. Man, Sridevi is still such a hottie. Lovely, but she looks a bit anorexic?! i totally agree with deewani. she looks amazing!! why am i feeling that Bonney Kapoor is wearing same tshirt and coat at both the events???? Its impossible to look at these two and not believe in fairy tales…you know which one I mean, the Beauty and the Beast. Sridevi still looks okay in Grey – the person who looks really bad in grey is Gauri Khan, and she insists on wearing grey, dull brown and black – none of which are her colors – and add the fake tan and bleached hair, me thinks she believes she’s a blonde white woman. she is still sooo beautiful!! Its a wonder how time froze her beauty…..
Sridevi and Hema Malini, they have that timeless beauty thing that is very rare today. 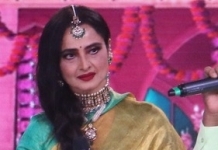 She looks gorgeous here..
sri is such a doll…this woman has got class all da way lookz like she is losin weight by the hour!like her in dat green chic sari n boney is an old dude so letz leave hime alone…. Simple and elegant. She obviously knows what works for her. She looks great! Sri Devi looks beautiful in both outfits. I love the green one, personally. Now, to more important things — is it me or does her husband hold a striking resemblance to koala bears? Bonney looks like he belongs somewhere in Dilbert! 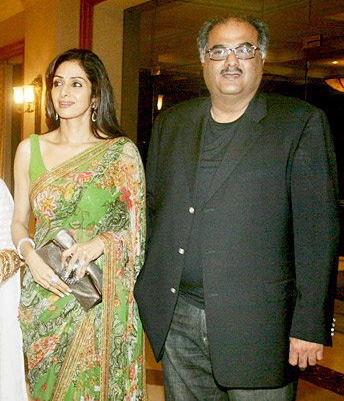 sridevi looks lovely in the green. she’s so graceful. i wonder what she saw in boney. he’s not easy on the eyes. The grey really didn’t work and it was making her look much older… the wierd lighting also made me believe that she was probably having grey hair too. Though the green makes her look great. I agree with someone he does resemble a Koala bear.. and i should know because i have seen them in my backyard. I guess they love each other a lot..love is blinding. love the saree on her! absolutely gorgeous color! boney looks like her father standing next to her… what happened?? 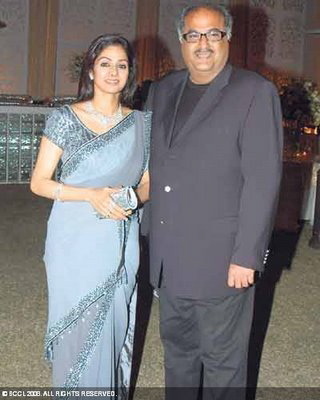 I agree that Sridevi looks elegant in both outfits and Boney looks like a bear. But you have to consider what all the surgeries have done to her face. If you compare a picture of her from the late 70s/early 80s to these, she looks like a different person. I hope she leaves her nose alone now. Any more whittling down and she will be in the same bracket as Koena Mitra. I grew up watching her act in South Indian movies movies. As far I remember, she was always well dressed. She looks sooo good in the green saree. 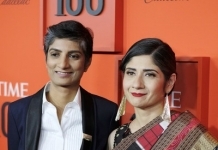 the saree is from which designer? ?can anyone tell me?? the saree looks great on her. i love the color. I agree with most of them. she has never aged. Also for those who are commenting that with so many plastic surgeries anyone wud freeze , is not always true. For bollywood ppl, you have not seen the REAL Sri. If you want, take time and watch her south films.She was even more great in them (even w/ the nose jo). And, coming to the dress sense, she was always a well-dressed woman and a fantastic actress who has acted in more than 250 films. Name one actress who can boast of tht number?? ?Ruling bollywood,tollywood and kollywood for 3decades at the same time is quite something. Name one female in the industry who is not depending on the cosmetic surgeries???? she has earned more than enough for her to marry BK. there must be a strong reason. sri has to be more than 50 yaar. her first movie was released around late 70s (i think 76) and she claimed to be 16 tho she looked 20-ish. where is this AMAZING diet doctor? If i can look like this at 50, I might as well go now…. Love both the grey and green on her. This woman can do no wrong. GORGEOUS!